Progressive Multifocal Leukoencephalopathy (PML) is a rare and serious brain disease that can lead to severe disability or death of the patient. The condition develops when the body can no longer fight off disease leading to damaged brain white matter (myelin cells) that protects the nerves. When the myelin cells are damaged, it makes it more difficult to think, move, or feel sensations. The diseases caused by a specific human polyomavirus, John Cunningham virus or JC virus, which has genetic similarities to SV40 and BK virus. Nearly every adult carries the virus that usually does not cause any health issues. However, at times when the body's immune system becomes weakened, the natural defenses that fight illnesses can no longer function properly. This is a progressive disease, which means that the condition will continue to worsen over time until it finally results in serious brain damage that diminishes the patient's quality of life or causes their death. This is because it affects the myelin, which is the brain's white matter. Some rare cases involve the brain's gray matter neurons. Who Is at Risk for Progressive Multifocal Leukoencephalopathy? AIDS Sufferers – Individuals who have AIDS are the greatest risk of developing progressive multifocal leukoencephalopathy because of their compromised immune system. Anti-Rejection Medications given to patients who have undergone an organ transplant tend to increase the potential risk of developing the condition. Multiple Sclerosis – This disease and other immune system disorders that attack essential nervous system like lupus or rheumatoid arthritis can increase the potential risk of developing PML. Medical science has yet to determine if the disease is brought on by the autoimmune problem or the medication used to treat their condition like corticosteroids, natalizumab, fingolimod, and dimethyl fumarate. Tysabri Medication – In 2005, Biogen Idec and Elan biotechnology companies voluntarily chose to withdraw their new medications to treat relapsing and remitting cases of Crohn's disease and multiple sclerosis after it was discovered that two patients suffering from multiple sclerosis developed progressive multifocal leukoencephalopathy after taking the treatment drug. Age – A study conducted at the Mayo Clinic involving 58 HIV-negative patients who have been diagnosed with Progressive Multifocal Leukoencephalopathy at their clinic developed the disease with no identifying predisposing illness other than their ages that range from 66 years to 80 years. The longer the patient takes certain medications to treat other conditions, the greater the risk of developing progressive multifocal leukoencephalopathy. One research paper revealed that of all the cases involving progressive multifocal leukoencephalopathy involved in the study, 80 percent of the patients were also suffering from AIDS. Many of the symptoms experienced by patients rapidly progress and develop into serious complications that can include coma and dementia. These symptoms are often caused by nerve damage and lesions that can develop at any location in the brain. Medical scientists consider progressive multifocal leukoencephalopathy to be a life-threatening emergency that could quickly result in death. As PML progresses, the doctor may suspect the condition exists based on symptoms, medications being taken, and any pre-existing condition. However, Progressive Multifocal Leukoencephalopathy symptoms mimic those associated with HIV-related diseases that include lymphoma, cryptococcal meningitis, or toxoplasmosis affecting the body's central nervous system. Blood Testing – Obtaining a sample of blood can help identify the presence of JC virus antibodies associated with PML. Excessive levels of these antibodies can help verify a diagnosis of the condition. Spinal Tap (Lumbar Puncture) – Obtaining a sample spinal fluid can also reveal the presence of JC virus antibodies and assist the doctor in making a validated diagnosis. Brain Biopsy – The doctor may recommend a brain biopsy where a small sample of tissue was removed from the brain under the skull to be analyzed in a laboratory setting by a qualified pathologist looking under a microscope. 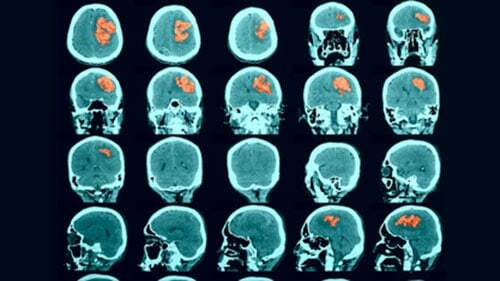 Imaging – The doctor may recommend imaging tests including CT (computerized tomography) scans, or MRI (magnetic resonance imaging) scans that can detect white matter lesions in the brain. If multiple active lesions are present in the scan, the results can assist the doctor in verifying PML. Usually, a lesion will present itself and an MRI scan as a dark or white spot. When identified, the doctor will likely order of brain biopsy to verify the presence of PML inside the lesion. Progressive Multifocal Leukoencephalopathy has a high mortality rate among both men and women. Even so, medical scientists have yet to find a cure or specific treatment for PML. Instead, after a diagnosis for progressive multifocal leukoencephalopathy has been verified, the doctor will tailor therapies to assist with date specific circumstances of their patient that are caused by the condition while taking into consideration the patient preferences and other health issues. Highly active anti-retro viral therapy to reduce viral reproduction to treat AIDS and HIV sufferers with a verifiable diagnosis of PML. Some patients are ideal candidates for clinical trials associated with Progressive Multifocal Leukoencephalopathy that are being conducted at hospitals in the United States and in Europe. Is Progressive Multifocal Leukoencephalopathy Preventable? At the present time, there is no way to prevent the development of PML. This is because the development of the condition is caused by immune suppression, which is difficult to do when the patient is suffering from other immune system related problems. However, the doctor will likely recommend ARV (anti-retro viral) therapy to slow the rate of the disease's progression before it can cause significant impairment to the body. Some patients who have undergone ARV therapy have gone into remission where the likelihood of the disease recurring is extremely low. Some doctors offer short-term use of corticosteroid medications as a preventative measure during the initial phase of ARV therapy to treat progressive multifocal leukoencephalopathy.